The Archaeological Institute of America turns 140 years old in 2019--celebrate with us at ArchaeoCon! Join us for a day of celebration that will include small group workshops, an ancient game tournament, a Q&A session with experts, and an activity fair packed with hands-on experiences, demonstrations, archaeology presentations, and more. 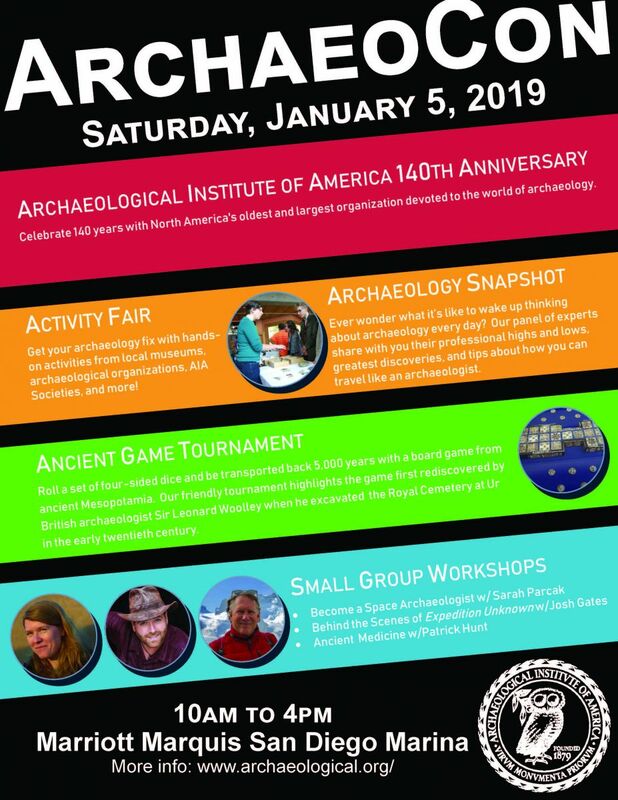 ArchaeoCon 2019 is being held in connection with the 120th AIA-SCS Annual Meeting, but is open to the public. For those not registered for the AIA-SCS Annual Meeting registration for ArchaeoCon is $5 for AIA members and $10 for general admission. Need a hotel room? Book a room using our discounted rate. Most importantly, bring yourself (and a friend)! You might want to bring a notepad if you enjoy taking notes. If you plan to attend the Space Archaeologist workshop, some kind of device (tablet, laptop, or even a phone) would be useful. Contact Ben Thomas (bthomas@archaeological.org) or Meredith Langlitz (mlanglitz@archaeological.org) with any question you have about the event. Some AIA Local Societies are looking into group transit options, so please be sure to check in with your Local Society if that's something that interests you. The Marriot Marquis is located less than a mile from the San Diego Santa Fe Depot Amtrak Station and is 3 miles from the airport. The San Diego Trolley's Green line's Convention Center Station is just across the street. The Marriott Marquis has on-site parking as well as valet parking. Look for other parking options here and here.